Before you get started, I'll warn you that making bead angels is addictive! And what's better is that they are easy to make, since many bead manufacturers and bead stores have started carrying wing beads in one form or another. But, if your bead store does not carry wing beads, don't despair. This tutorial will also show you how to use other beads such as leaf shapes or daggers to make angel wings. Bead angels are popular for a number of reasons. One of the most important is that they are so pretty! But they can also be a symbol of hope or a sentimental reminder of those who we like to think are with us in spirit. The easiest way to make bead angels is to buy strands of beads specially made for this project. They consist of a bead for the angel skirt or body, a set of wing beads, a head bead and a spacer bead for a halo. These angel beads from Michael's are available online or in the store. You can even check if they are available at your local store from their website. To make bead angel earrings, you will need a couple of two-inch headpins and earring findings in gold or silver to match your beads. We like to use hook earwires. The jewelry making tools you will need are three of the basic wire jewelry making tools: wire cutters, round nose and flat nose pliers. Arrange your beads so you have a skirt or body bead, a wing bead a head bead and halo. Put the beads on a headpin in that order. To keep the beads in place and provide a loop for hanging, make a simple wire loop or make a wire wrapped loop above the halo bead. Using your pliers, open the loop on a pair of earwires and slide the angel dangles on and close the loop. Your first pair of angel earrings is complete! Once you know the basic components for a wire and bead angel, you will be able to make a wide variety of styles. Look for other bead wings in small, medium and large sizes to coordinate with the other beads in your stash. If you can't find angel wing beads, read on for another way to make bead angels. The materials and tools for these bead and wire angels are a little different from the last project. Instead of using a wing shaped bead you will be making the wings from two separate beads. This project uses two howlite leaves that are drilled through the center. We also used a glass charm with a hanging loop for the angel body instead of a center drilled bead, but this was a personal preference. You can easily thread both wires through a center drilled bead instead of using a charm. You will need a piece of 24 gauge wire about 6 inches long for each earring as well as wire cutters, round nose pliers and flat nose pliers. Make a bend in the center of the wire and add your angel body bead. Separate the wires so there is one on each side of the body. Add a leaf bead to one side and bend the wire under and around the bottom of the leaf to keep it in place. If you are using a charm, put the wire back through the hanging loop. Repeat these steps with the wire on the other side. If you are not using a charm for the body, you can twist the two wires together where they meet in the center to secure the angel wing beads in place. Arrange the two wires so they are straight and close together. Add the head and then the halo beads to both wires If necessary, trim the wire ends so they are easier to put on the wire. Slide the beads all the way down to the wing beads. Since you are working with two thin wires, it is best to finish this bead angel with a wire wrapped loop. Add a wire wrapped loop above the halo, wrapping as many times as necessary to keep the beads in place. Complete your jewelry project by adding earwires or a chain. If the wing beads do not stay flat, you can twist the wire slightly with your round nose pliers to tighten it around the bottom of the leaf beads. Get Creative with Your Bead Angels! It is fun to get creative with your bead angels! With larger beads, you can make pendants or ornaments. 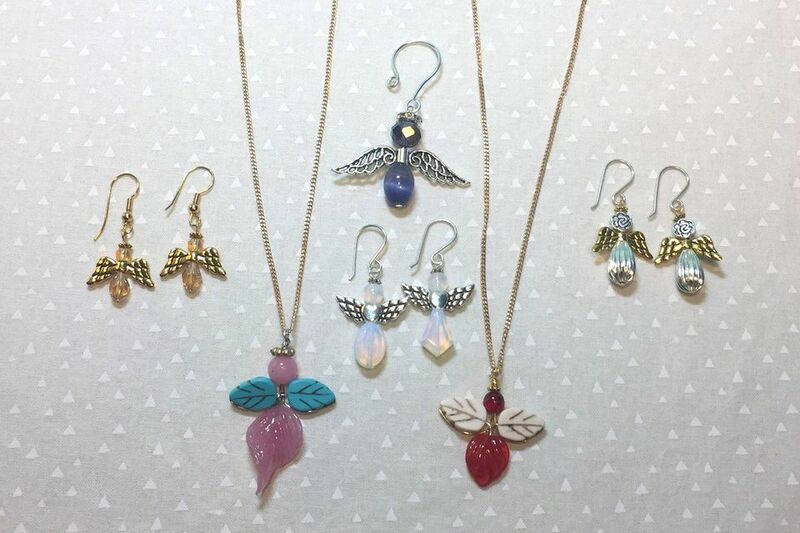 Mix gold and silver metals for the flexibility to wear the angels with any outfit or jewelry. If you don't have wire or headpins, here is a bead angel variation that uses stringing wire and crimp beads instead.